Ionic is a completely open source SDK for hybrid mobile app development. If you know how to build Websites, then you already know how to build Mobile Apps! Ionic is a completely open source SDK for hybrid mobile app development. It was created by Max Lynch (Co-Founder and CEO), Ben Sperry (Co-Founder and Chief Design Officer), and Adam Bradley (Co-Creator and framework lead) of Ionic, formerly known as Drifty Co. It is built on top of Angular JS and Apache Cordova. Ionic provides tools and services for developing hybrid mobile apps using Web technologies like CSS, HTML5 & SASS and it offers quality web and native app components for building highly interactive native and progressive web apps with Angular. Apps developed using it can be easily distributed through native app stores to be installed on devices. Performance: Is built to perform great on the latest mobile devices. Designed with best practices like touch-optimized gestures and efficient hardware accelerated transitions. Angular & Ionic: Builds on top of Angular to create a powerful SDK well-suited for building rich and robust mobile apps for the app store and for the mobile web. Built for serious app development: Is using Angular JS MVC architecture for building rich single page applications optimized for mobile devices. Native and Web: Follows standard native mobile app UI guidelines and uses native SDKs, bringing the UI standards and device features of native apps together with the full power and flexibility of the open web. Ionic uses Cordova to deploy natively, or runs in the browser as a Progressive Web App. Beautifully designed: Clean, simple, and functional. It has been designed to work and display beautifully on all current mobile devices and platforms. With ready-made mobile components, typography and a gorgeous yet extensible base theme that adapts to each platform, you will be building in style. Has a powerful CLI: Use just one command to create, build, test and deploy your Ionic apps onto any platform. With amazing features like Live Reload and integrated logging. 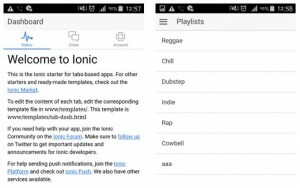 Built by web nerds: Built and maintained by developers and designers passionate about web technologies, Ionic focuses on pushing the web forward across all mobile devices and makes mobile development awesome with web technology. Live Reload: One of the best features of the Ionic CLI is the LiveReload server that gets started when you run ionic serve. This allows you to develop your app in the browser and it will update instantly when changes are made to any development files. Without re-compiling & redeploying after every single change, changes will be loaded. Ionic View: Valuable platform for uploading, sharing and testing your application on native devices. License: Ionic is released under MIT license. CSS components: With a native look and feel, these components offer almost all elements that mobile application needs. The components default styling can be easily overridden to accommodate your own design. Ionic CLI: This is NodeJS utility, powered with commands for starting, building, running and emulating applications. Ionicons: This is the icon pack which includes hundreds of the most common app icons. Ionic View: A cloud platform for managing and scaling cross-platform mobile apps. Integrated services enable you and your team to build, deploy and grow your apps efficiently. It makes it easy to preview your Ionic/Cordova app, share your apps with clients and testers around the world without having to go through the App Store. Hybrid app development saves time: This means that you can package your applications for IOS, Android, Windows Phone and Firefox OS which can save you a lot of working time and cost of not having to develop two application for Android and iPhone. Customizable default layout: Starting your app is very easy since it provides useful pre-generated app setup with simple layouts which are easy to customize. Maintainable: The apps are built in a very clean and modular way, so it is very maintainable and easy to update. Regular framework updates: Ionic developers are working together with Google developers to improve the framework. The updates are coming out regularly. Support: Ionic support group is always willing to help when needed. Testing for multiple devices & platforms: Testing can be tricky since the browser does not always give you the right information about the phone environment. There are so many different devices and platforms and you usually need to cover most of them. Compatibility issues with native functionality: It can be hard to combine different native functionalities. A lot of the time you will run into plugin compatibility issues, which leads to build errors hard to debug. Since Ionic is built on top of AngularJS and Apache Cordova you will need to have a basic knowledge about these technologies as well. Shown below is how a sample app is created, built, run on an emulator and, deployed and run on devices. 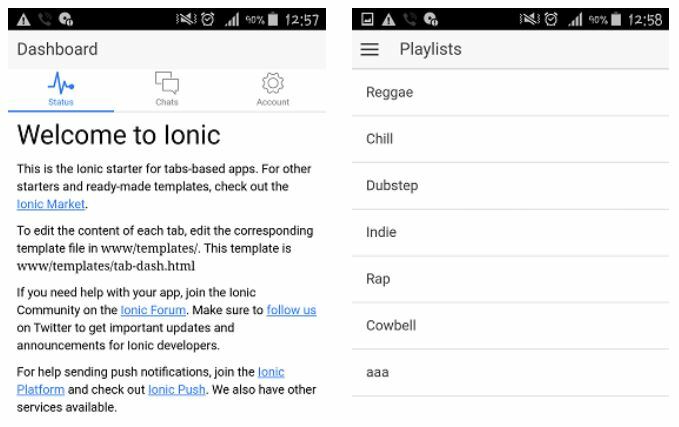 Ionic has some basic types of default app templates, blank app (a bare starter with a single page), tabs app (a simple 3 tab layout) & side menu app (a layout with a menu on the side that can be swiped). Setup the environment for Ionic apps for Android with JDK, Android SDK, Android API packages & Build tools. start will tell the CLI to create a new app. myTabsApp will be the directory name and the app name of your project. tabs will be the template for your project. Add it directly to Visual Studio by downloading and double-clicking on the VS Extension for it. Or in a New Project dialog box, select Online. In the search box, type Ionic Project Templates for Visual Studio. You can download and add IntelliSense for Ionic to your project. Add the Android platform by selecting Android as a debug target (in solution Platforms list), and then choose Build, then Build Solution.